Rivers State Deputy Governor, Dr. (Mrs.) Ipalibo Harry Banigo (middle),with the Chairman, Governing Council, Beeson Kenule Saro-Wiwa Polytechnic, Bori, Chief Adokiye Amiesimaka (right), Rector, Engr. Dr. Onengiyeofori Moses Princewill (2nd left) and others, during the convocation ceremony of the institution in Bori, last Saturday. Rivers State All Progressives Congress (APC) governorship aspirant, Dumo Lulu-Briggs, has defected to Accord Party. Lulu-Briggs, a former chieftain of the APC, who contested the last APC governorship primary, announced his decision to pursue his governorship ambition on another party’s platform in a statement titled: ‘Taking Leave of a Family,’ yesterday morning said “Hard decision because I formally joined you in April last year and you received me with warmth and love. ‘You made me feel at home, and we worked hard as a family to reposition the party and stabilise our leader, Rt. Hon. Chibuike Rotimi Amaechi, who was then under tremendous pressure. We quickly rolled up our sleeves and labored behind our leader and with you. “Inspired by the leader’s claim to equity, justice, and fair-play we inconvenienced ourselves to ensure success and our beloved All Progressives Congress became bigger and stronger. The claim by the leader that Rivers State should be governed at this time by someone of riverine extraction was believed to be a sincere and patriotic position. Hence we encouraged the membership to follow wholeheartedly. “The facts are known, we took steps to protect the party from sliding into a personal estate, our leader in the APC by default becomes a feudal lord, then our state is doomed. I have nothing personal to lose or gain, but we have all to lose if in a democracy we allow the aberration of overlords, hence my decision. While we were together I enjoyed your comradeship and so find it hard to leave, yet, men of conscience would when necessary overlook personal sentiments and emotions. “I am 100 percent Rivers just as you and so I trust that we shall keep our friendship and possibly realign if and when we feel the need. I bear no grudge or malice and I implore that you take none toward me, what is obvious is that I have to continue my quest to help liberate our state by advancing my vision on another platform,” he stated. In Enugu State, aggrieved aspirants under the platform of the All Progressives Congress, APC, in Enugu State, yesterday demanded a refund of the money they paid for nomination and expression of interest forms. They made the demand before the Kano Governor, Umar Ganduje-led peace and reconciliation committee. The committee met with the aspirants as part of its on going peace process across the country. Mr. Ben Eche, who spoke on behalf of governorship aspirants, said the National Working Committee, NWC of the party committed fraud in Enugu State. He told the committee that “the primary conducted in Enugu State was entirely faulty. The party knows that nothing was done. “Return our money and the local chapter of the party will now call us, if you don’t do the first one, the second one will be hard to accomplish. While toeing same line, the Director General of the Voice of Nigeria, Mr. Osita Okechukwu, who contested for Enugu West senatorial seat, said what happened in Enugu was unimaginable. Okechukwu, represented by Barr. Onwusi said “People stayed somewhere, allocated votes to those they want. “What happened in Enugu is a situation where you finish building a house, some people knocks and then you opened the door, they came in and started laying claim to the house. Nobody will allow that kind of thing. Meanwhile, a female House of Reps aspirant, Ginikar Tor lamented that she was deceived by the party. “I was asked to step down, and I obeyed, but shockingly, the name that later appeared was not the person I was asked to step down for. 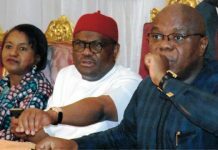 Meanwhile, the All Progressives Congress was still battling with crises in at least eight of its state chapters despite the expiry of the deadline for the replacement of candidates last Saturday. The Independent National Electoral Commission, in its notice of the 2019 general elections released in January this year, gave political parties December 1 deadline to substitute their candidates for governorship and state assembly elections. The deadline ended midnight last Saturday. 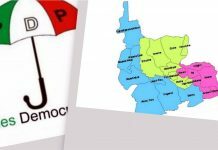 Although many political parties met the October 7, 2018 deadline given to them to conclude their primaries, a lot of them were still battling with crises arising from the shadow elections. Investigations by our correspondents across the country showed the APC was concerned about crises in states including Ogun, Delta, Imo, Zamfara, Oyo, Ebonyi, Katsina and Ondo. A top official of the APC in Ogun State, who confided in our correspondent said that a faction of the party, led by an ex-governor of the state, Chief Olusegun Osoba, produced the governorship candidate, Mr Dapo Abiodun, but the executive council of the APC was firmly controlled by Governor Ibikunle Amosun. The minister told one of our correspondents that despite the crisis in the party, he believed the crisis could be resolved, adding the right thing must be done. According to him, the only thing he needed from the peace committee set up by the party’s NWAC is restitution with justice, adding that reconciliation will follow. Reacting to Shittu’s claim, the Director of Media, Research and Strategies of the party in the state, Dr AbdulAzeez Olatunde, said the fact that “he (Shittu) is a minister of Federal Republic of Nigeria is enough for him to humble himself and carry himself around with dignity. In Delta State, efforts by the national leadership of the APC to reconcile aggrieved members have not yielded any positive result. Our correspondent gathered that a faction led by Olorogun O’tega Emerhor and Chief Hyacinth Enuha was still angry with the manner the National Chairman of the APC, Adams Oshiomhole was handling the crisis in the state chapter of the party. It was learnt on good authority that the Emerhor faction lost out entirely in the last primaries of the party as Oshiomhole denied the group the opportunity of fielding any candidate. Although, the Jones Erue-led faction, which enjoys Oshiomhole’s support, had set up a reconciliatory committee led by Chief Richard Odibo, nothing tangible had been achieved. The faction led by Chief Cyril Ogodo, which also includes Emerhor and Enuha, has vowed to continue with its legal battle despite the threat by the APC NWC to sanction those who refused to withdraw their cases. 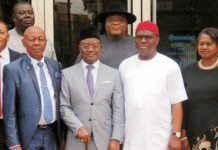 The Ebonyi State Chapter of the APC said there was no aggrieved member who instituted a case other than one of the governorship aspirants, Prof Benard Odoh. Speaking with one of our correspondents in Abakaliki , the state capital, the state Chairman of the party, Dr Eze Nwachukwu, said although the suit filed by Odoh was still in court, efforts were still being made to reconcile all aggrieved members of the party. Members of the group include Abubakar Isa and Garba Dankani. The two party chieftains nursed governorship ambitions and wanted to contest against Governor Aminu Masari, but they preferred direct primaries. 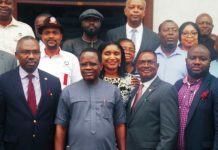 In Imo State, despite the visit of the NWC peace committee to the state last Thursday, it was gathered that a former Chief of Staff to the state Governor, Uche Nwosu, would formally announce his defection to Democratic Peoples Party next week. Nwosu is the preferred governorship candidate of the state governor, Rochas Okorocha, but the Oshiomhole-led NWC picked Senator Hope Uzodinma as the gubernatorial candidate of the APC in the state. 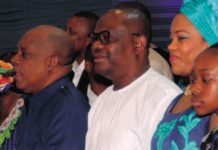 The governor last Tuesday in a press conference hinted that all those denied tickets including his son-in-law, Nwosu, might join another party. In Ondo State, the two groups in the state chapter of the APC have yet to agree on the harmonisation of the House of Assembly candidates’ list. 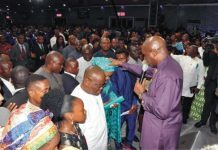 It was gathered that one of the two groups was loyal to Governor Rotimi Akeredolu while the other faction was loyal to the aggrieved leaders of the party, especially a serving senator representing Ondo North Senatorial District, Ajayi Boroffice and a former Deputy Governor of the state, Alhaji Ali Olanusi. It was also learnt that each of the two factions presented a list of candidates to the national leadership for screening after which the list would later be sent to the INEC. However, a source in the party told our correspondent that the two groups had not agreed on those that should be dropped from the two lists. In Zamfara State, there are indications that the party may not field candidate during the 2019 governorship election as INEC is insisting that it did not meet the deadline for conducting primaries for gubernatorial poll.